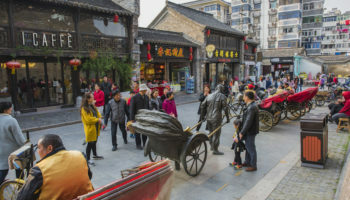 When most people go to China, they only want to see the Great Wall and Forbidden City in Beijing, walk along the Bund at Shanghai or take in the Terracotta Warriors at Xi’an. Maybe they’ll throw in a visit to Guangzhou or take a Yangtze River cruise. But there’s much more to China than just these famous sites. There are plenty of amazing tourist attractions in China, from ancient cities to forests to temples to rice fields that look like they’ve been designed by artists to sacred mountains and stunning waterfalls. This desire to explore off the beaten path where Chinese tourists outnumber foreign tourists isn’t just confined to 20-something backpackers. Any traveler armed with a good phrase book, a pot of patience and a marvelous sense of humor should do just fine. Hundreds of years ago, the Chinese built massive stone walls around their cities to defend them from invaders. Xi’an was no exception. This city’s wall survives today, and is considered one of the most well preserved in China. The wall is 12 meters (40 feet) tall and about 15 meters (50 feet) wide at the bottom, tapering to 12 meters (40 feet) at the top. Walking on this wall is a must-do for visitors to this ancient capital of China. Located about a mile northwest of the ancient city of Dali in southern China, The Three Pagodas are one of the best preserved Buddhist structures in China having endured several man-made and natural catastrophes. The middle pagoda, built during 824-840 AD by king Quan Fengyou, is 69.6 meters (227 feet) high and is one of the tallest pagodas in China. The other two pagodas were built about a century later. Established in 1982, Zhangjiajie National Forest Park is the first national forest park in China and is part of the Wulingyuan Scenic Areas. With its clear streams, weird-looking peaks, wildlife and abundant sub-tropical vegetation, the park is a year-round magnet for visitors. Key attractions include the Golden Whip Stream where visitors can see fish swimming in the crystal-clear water. The Stone Forest, or Shilin in Chinese, is a set of karst formations in southwest China. The stones jut from the earth similar to the way a stalagmite does in a cave. These stones are thought to be 270 million years old. The area was an ocean floor and the flow of water created the majestic pinnacles. The stone forest receives over 2 million visitors a year. Lijiang Old Town is one of Yunnan Province’s top tourist magnets, drawing visitors who want to sample life in a minority area. Kublai Khan was the first emperor to live in this 800-year-old town that is affiliated with the Naxi minority culture. Almost 350 bridges cross canals that meander through the city, which is a good place to see colorful Naxi architecture and residents wearing native costumes. Travelers who’ve seen Crouching Tiger, Hidden Dragon already know how scenic the Wudang Mountains, located in northwestern Hubei Province, are. Besides being scenic, the Wudang Mountains is the most sacred Taoist mountain range in China. There travelers will find temple complexes, including the palatial Nanyan Temple, considered the most spectacular of the 36 temples on Wudangshan because it’s built of rock from the cliff behind it. 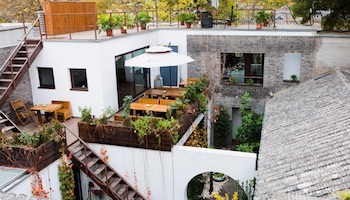 Zhouzhuang is one of the most famous water towns in China. Often referred to as the “Venice of the East,” the town is criss-crossed with rivers and streams lined with ancient houses. Located less than 32 km (20 miles) from Suzhou in east China, Zhouzhuang is famous for its twin bridges, Shide and Yongan that are symbols of the town. A boat ride is a good way to see the city. 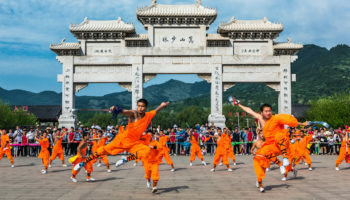 Mount Tai, in Shandong Province, is one of China’s Five Sacred Mountains. Climbing Taishan (“shan” is mountain in Mandarin) was one of the first things a new emperor did; it’s said that 72 emperors made the climb. 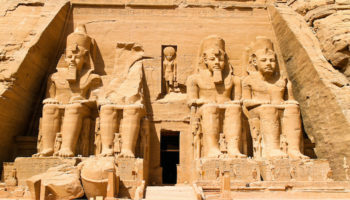 They left behind great temples, inscribed tablets and other cultural relics. Travelers with imperial leanings will want to climb the 6,000-step east route as that’s what the emperors did. Tiger Leaping Gorge is situated on the Yangtze River in southwestern China. About 15 km (9 miles) in length, the canyon passes through a series of rapids surrounded by mountains on both sides that sharply rise 3,000 meters (10,000 feet) above the river. It is believed to be the deepest canyon in the world – depending on the criteria applied. The hiking trail through the gorge is one of the most accessible and satisfying in China, with dramatic scenery. The hike is not to be taken lightly though. Even for those in good physical shape, it’s a workout and can certainly wreck the knees. Accommodation along the way is in guesthouses, so hikers won’t need a tent. Suzhou is a picturesque city located on the Grand Canal about 65 km (40 miles) from Shanghai. It is famous for its silks, the canals that run through the city, and for its classical gardens with their fish ponds and rockeries. Suzhou has about 80 classical gardens; the Humble Administrator’s Garden is among the most famous. A canal boat ride is a good way to experience the exquisiteness of Suzhou. Travelers along the ancient Silk Road will definitely want to stop at Dunhuang for a visit to the Mogao Caves, which are representative of early Buddhist cave art. Unlike the Yungang Caves, which featured Buddhas carved into hillsides, the Mogao Grottoes mostly feature murals painted on cave walls. Some of the paintings date back to the fourth century. At one time, there were more than 1,000 cave temples. The Longji or Dragon’s Backbone rice terraces were built over 500 years ago during the Ming Dynasty. The terrace fields are found in Longsheng about a two hours drive from Guilin. From a distance, during the growing season, these winding terraces appear as if they were green woven cables laid out over the hillsides, starting at the riverbank and ending near the mountaintop. Visitors can meander through the paddies and villages, greeting and being greeted by horses, pigs, chickens and hard working locals. Located in northwest Beijing, the Summer Palace was once a playground for China’s imperial families who wanted to escape Beijing’s summer heat. It was constructed in 1750, but was destroyed a hundred years later when the French and British invaded Beijing. Its restoration was not without controversy as the Empress Cixi embezzled funds from the Navy to build the Marble Boat, which really isn’t marble but wood painted to look like marble. The Yangtze River runs along some of China’s most interesting and famous sites, including the stunning Three Gorges. On a Yangtze River cruise, travelers will travel through some of this immense country’s most gorgeous landscapes and may also have the option of taking shore excursions to various interesting sites. The Yangtze River is also home for a number of this country’s endangered species, including the Chinese alligator and river dolphin. Perched precariously halfway up a cliff some 75 meters (246 feet) above the ground, the Hanging Monastery is one of the most remarkable sights in China. Consisting of a complex of 40 rooms linked together by mid-air corridors and walkways, this remarkable monastery appears to be glued to the side of a sheer precipice. The original monastery was built in the 5th century and has been repaired and extended many times during its long history. Reed Flute Cave known as “the Palace of Natural Arts” is located in the northwest of Guilin in southern China. According to a legend, Reed Flute Cave got its name because people believed that the reed by the cave’s mouth could be made into flutes. The limestone cave offers a majestic fairyland of stalactites, stalagmites, stone pillars, stone curtains, birds, plants and animals in fantastic shapes and colors. The Yungang Caves or Grottoes at Datong is one of the great examples of early Buddhist cave art. 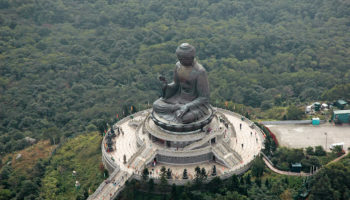 Here, monks carved more than 51,000 statues, ranging in size from several inches to tens of feet high into the hillside. Work on the carvings in the 252 grottoes took place in the fifth and sixth centuries. If possible, visitors recommend coming here in off-season when it is less crowded. One of the main reasons to visit Hangzhou, capital of Zhejiang Province, is to see West Lake, a large freshwater lake that is the symbol of this East China city. Forested man-made islands with temples and pagodas dot the lake, which is rarely deeper than five feet. West Lake, considered one of the most beautiful lakes in China, is divided into smaller lakes. It was once an imperial retreat. Located in southwestern China, Jiuzhaigou is a nature reserve officially known as Jiuzhai Valley in English. The national park has been described as a fairyland because of its many waterfalls; snow-covered karst mountains, and its 108 blue, turquoise and green colored lakes that are so crystal clear one can see the bottoms. It is also the habitat of giant pandas, though the chances of seeing them are slim due to the park’s size and the number of tourists. The Longmen Grottoes are densely dotted along the Xiangshan and Longmenshan mountains in the eastern central part of China. Construction of the grottoes began in 493 AD. There are over 2100 niches, more than 100,000 Buddhist statues, some 40 pagodas and 3600 tablets and steles in the caves. The 17 meter (56 foot) high statue of Vairocana in Fengxian Temple is the most representative of the trove. 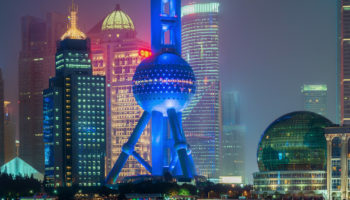 Pudong is a district in Shanghai on the eastern side of the Huangpu River that has emerged as China’s financial and commercial hub. A skyline of gleaming skyscrapers rises out of what was mere farmland only 20 years ago. 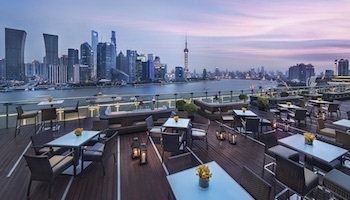 Skyscrapers includes the symbolic Oriental Pearl Tower, the Shanghai World Financial Center, the Jin Mao Building and the Shanghai Tower that was finished in 2014. The Hani Rice Terraces are located on the southern slopes of Ailao Mountain in Yuanyang, and have been cultivated for over 1,000 years. Carved by hand by the Hani people, these rice terraces have turned a barren hillside into a lush sub-tropical paradise. Water is saved in the hilltop forests, and channeled down to the terraces for irrigation. 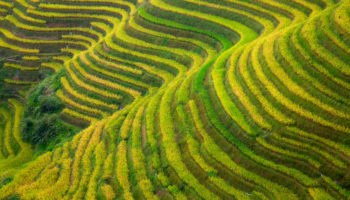 The rice terraces are flooded from December to March, presenting a spectacular view to travelers. Mt. Emei is home to the first Buddhist temple in China, built in the first century. But the most remarkable of the Emeishan Buddhas is the Leshan Great Buddha that was carved out of a hillside in the eighth century. The statue stands about 71 meters (233 feet) high and has three-meter (11 feet) long fingers on each of its enormous resting hands. The Giant Buddha ended up making the raging rivers below more navigable as stone remnants from the statue were dropped into the water. 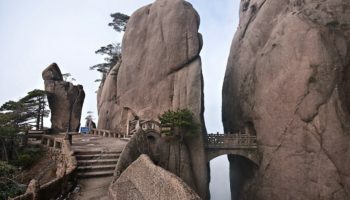 One of China’s major tourist destinations, Mount Huang is a mountain range in eastern China also known as Huangshan (“Yellow Mountain”). The area is well known for its scenery, sunsets, peculiarly shaped granite peaks and views of the clouds from above. Frequently shrouded in mist, the many peaks appear to float on clouds and have very fanciful names such as 18 Arhats Worshipping the South Sea, Lotus Flower Peak, Celestial Capital and Paint Brush. In ancient times almost 60,000 stone steps were carved into the side of the mountain range. Today there are also cable cars that tourists can use to ride directly from the base to one of the summits. A Li River cruise from Guilin to Yangshuo is the highlight of any trip to northeastern Guangxi Province. With its breathtaking scenery and taste of a life far removed from the concrete metropolis, the scenery along the Li River is one of the top tourist attractions in China. Mist-covered karst mountains dot the landscape adding to the aura of serenity. Traditional fishing boats ply the river, using cormorants to catch their fish. The best way to enjoy the scenery is to take a boat ride between Guilin and Yangshuo; since the terrain is flat, many travelers like to bicycle back. This mighty army of terracotta warriors and horses, found in three vaults, is one of the most famous archaeological finds in the world. It is the most popular tourist attraction in Xi’an and one of the most popular in all of China. The 8,000 lifelike terracotta warriors and 130 or so chariots have silently stood guard over the soul of China’s first unifier for more than two millennia. Although the weapons were stolen and the coloring has faded greatly, their existence and the fact that no two soldier’s faces are alike serves as a testament to the amount of labor and skill involved in their construction. Victoria Harbour is one of the deepest container ports in the world. 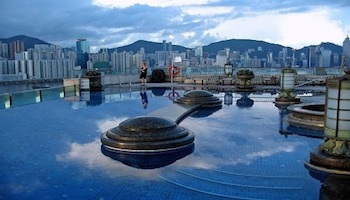 The bay offers stunning views of the skyscrapers of Hong Kong island on one side, and the Tsim Sha Tsui shoreline on the other. It is also one of the busiest harbors in the world with hundreds of ferries, junks and speedboats darting up and down the shore. Every night, many skyscrapers on both sides of Victoria Harbour light up in a synchronized show, known as one of the largest permanent light and sound festival in the world. One of the best ways to see the harbor is a trip on the Star Ferry. Built in the early 15th century, the Forbidden City served as the home for emperors in the Ming and Qing dynasties until Puyi, the last Emperor of China abdicated in 1912. It is a walled complex, surrounded by a moat, that is the world’s largest palatial complex. Legend has it that its 980 buildings contain 9,999 rooms, though the actual number is about a thousand lower. It is unarguably the most popular tourist attraction in Beijing, with the crowds to prove it. As the winter palace of the Dalai Lama from the 7th century the Potala Palace in Lhasa symbolizes Tibetan Buddhism and its central role in the traditional administration of Tibet. With over 1,000 rooms, the Potala contained the living quarters of the Dalai Lamas while they lived, and their sumptuous golden tombs when they died. It remained the residence of the Dalai Lama until the 14th Dalai Lama fled to India, after the Chinese invasion in 1959. The palace also houses great amounts of rare cultural relics including gold hand-written Buddhist scriptures and gifts from Chinese emperors. The palace is 14 stories tall and any visit involves climbing a lot of stairs up & down so make sure you are fully acclimated before visiting. The Great Wall of China is one of man’s greatest engineering feats and longest outdoor museum, stretching from Gansu Province in the west to Shanhaiguan on the Bohai Sea in the east. It was built, rebuilt, and maintained between the 5th century BC and the 16th century to protect the northern borders of the Chinese Empire from the attacks of nomadic tribes from the north. 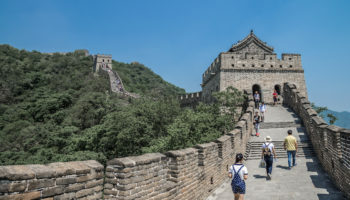 Most people will visit the wall somewhere in the Beijing area, where it is more easily accessible and where it snakes impressively over the mountain peaks. It is China’s No. 1 tourist attraction. 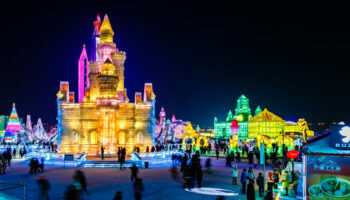 Which attractions in China do you consider to be the most interesting? 198 people have voted in this poll. I’ve visited China, one time. But I also wanted to know of some more places. But, now I came to know. Superb pictures and information I loved it. *added these to my list- Thank you for these great suggestions! I can’t wait to visit China soon. all these place looks beautiful . The Jiuzhaigou and the Reed Flute Cave looks so beautiful.